Minamoto no Yoritomo talking to Mario. Minamoto no Yoritomo was the shogun of the Kamakura shogunate, ruling Japan through the military government for seven years from 1192 until 1199. He established his role while forcing the emperor to recognize his position. He reigned until he accidentally died while riding on his horse. 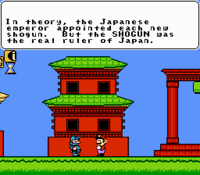 In the NES version of Mario's Time Machine, he is visited by Mario in 1192 after Mario travels back in time to return his stolen Sword. He is found in Japan wandering around a shrine. If Mario talks to him, Minamoto begins to talk about how he is the true ruler of Japan. He also threatens Mario, saying that Mario needs to return his sword to the shrine, underneath some lanterns.